We offer a fantastic gluten-free bread mix. This bread isn't the typical "white cardboard" those of you who are gluten free are used to. It has 9 different gluten-free grains that give it tons of flavor, and it cooks up much like a whole-wheat bread. Haven't had a sandwich in a while? Now you can! Ingredients are: Whole, stoneground grains (sorghum, corn, millet, rice, teff, amaranth, buckwheat, quinoa, wild rice), cornstarch, tapioca flour, salt, and xanthan gum. You add water, eggs, yeast, oil and honey. Rice is a common ingredient in gluten-free baking. 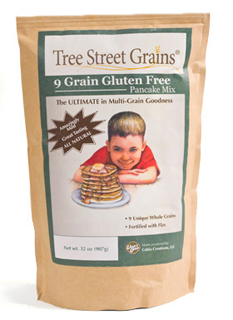 Here we offer a wide variety of Gluten-Free Brown Rice products. Great taste, big crunch and all natural goodness! 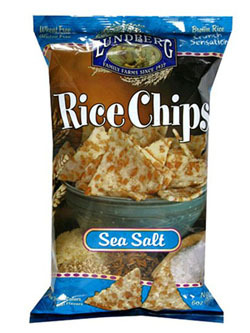 Lundberg's® award-winning Rice Chips are an all-natural snacking experience. Our Rice Chips are gluten free and made with the whole-grain goodness of brown rice. Now available in seven tempting flavors: Sea Salt, Santa Fe BBQ, Fiesta Lime, Sesame Seaweed, Honey Dijon, Wasabi, and Pico de Gallo. These rice cakes are made with freshly milled brown rice to ensure freshness, great taste and whole-grain goodness. With nearly twice as much rice as other brands, these cakes are packed with twice the flavor, value and nutrition. 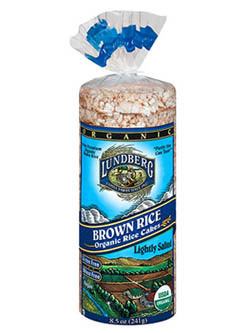 Lundberg Family Farms® Rice Cakes are wheat free, gluten free, and are made with the wholesome, natural goodness of brown rice. Truly exceptional taste and a healthy snack for the whole family! 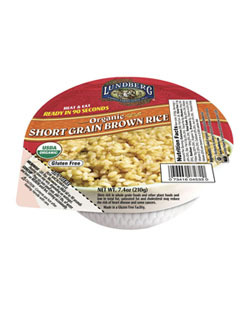 Lundberg Family Farms® introduces quick, convenient, healthy brown rice that cooks perfectly every time. Just heat & eat! It's ready in seconds, making it easy to get your daily servings of whole grains. It can be served as a side dish or used as a base in your favorite rice recipes. Lundberg's Heat & Eat is available in 3 popular rice varieties: Short Grain Brown, Long Grain Brown and Countrywild® Brown. 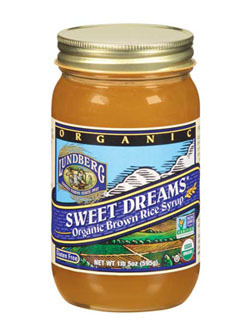 Lightly sweet, amber-colored and smooth, Lundberg Sweet Dreams® Brown Rice Syrup is a nutritive sweetener that is about half as sweet as sugar. Brown rice syrup is a tasty alternative for those who watch their sugar intake. Bake with it, pour it over ice cream or pancakes, or stir it into your morning smoothie! A wonderful Gluten-Free version of the16-grain pancake mix. Reports from those who have tried it have been extremely favorable! Also check out the Amazing Gluten-Free Bread Mix from the same company. People are raving about this wonderful bread. Recipe for both: 1 egg, 2 Tbs vegetable oil, 3/4 cup milk to 1 cup of mix to make 6 pancakes. Does it seem that Rice is the only Gluten-Free Grain you can eat? Not so! There is such a variety of wonderful, high-protein, whole grains that nature has provided for our enjoyment. These are listed in the following order form. Note that the Gluten-Free Grains are marked GF! Experiment with these! Cook them and use them in place of rice in recipes. Grind them and add them to your pancake or waffle batter. Don’t forget that legumes and beans are also gluten free—and great for your health!